A relationship is when one asset references another (i.e., an image used on a page, a page that links to another page). Finding relationships is imporant as actions performed on one asset (such as deleting or renaming it) may have an impact on others. ﻿Finding relationships is a safety check that may require further action; see the Tips below for guidance on when to check for relationships and what further actions may be required. Actions are available for the relationship assets. Perform an action using the tools provided at the top of the list. When should I check for relationships? In the example above, the More details link provides a list of relationships that will be affected. When should I publish relationships? When you move and rename assets, the CMS will automatically update the relationships to reference the new location or name, however it will not publish the updated relationships to your staging or live sites. 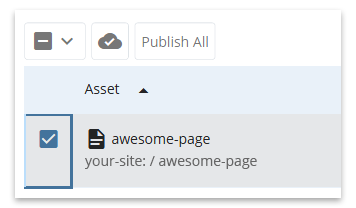 Use the actions above to publish the related assets, or perform a full-site publish if the change you made affects a site-wide element such as the navigation.